Any XJ axle needs the perches repositioned whether you do spring over or spring under. The perches are in different spots, the XJ perches are wider apart than the MJ. Unless you get an MJ axle, you have to remove the perches and move them no matter what. It's not a hard job, just need a welder. If the perches aren't moved inward, the springs bind up really bad and causes problems. Persoanlly, Id find a 8.25 and not bother with a d35 at all. 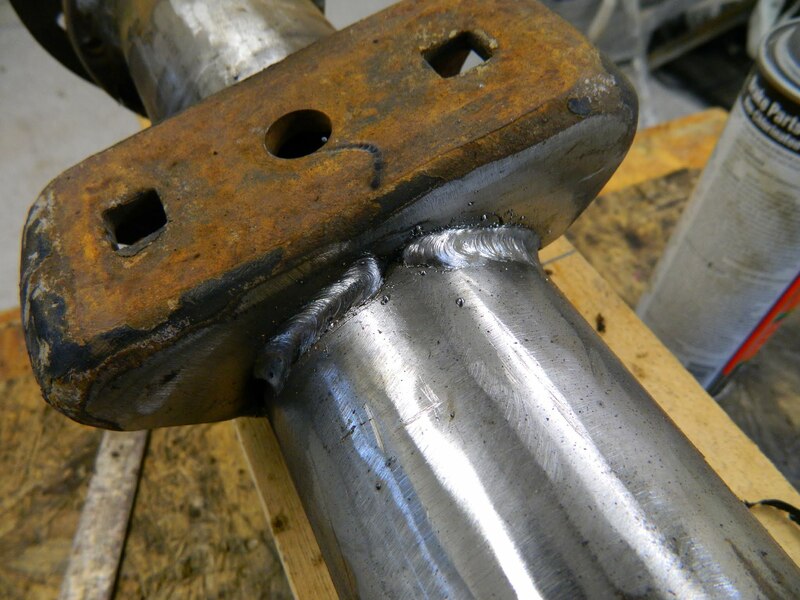 Re weld perches in the correct spot and ditch the boat anchor of the d35 all together. Plus you can find on from a liberty and could add in some rear disk. 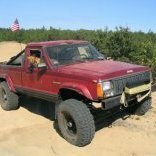 Normally I would agree with Smokeyyank and advise you not to bother with the XJ Dana 35. But -- since you already have it, and you're not looking for a lift so I assume your MJ is stock and not running huge tires, the Dana 35 should be okay. The one in my '88 XJ has gone 287,000 miles, and that includes having wheeled it at Paragon Offroad Park a number of times, as well as fire roads and such around New Mexico. Dzimm posted a diagram with the key information. Bottom line is that you will need to weld perches onto the XJ axle to exactly match the location and angle/orientation of the MJ axle. You can either cut off the existing perches and relocate them, or buy new ones. You'll have to cut them off to avoid interference with the U-bolts, so IMHO you might as well cut them off neatly and reuse them. Personally I would go with an 8.25. The D35 just doesn't hold up in the long run. Since he needs to spend money on the D35 to swap it in I would look for an 8.25 and spend a little more to increase the strength. I'm not saying everyone will break their D35 or that they can't work, but I personally had a D35 break in a comanche with 29" street tires that has seen nothing more than a dirt road twice. He can reuse the perches if they are cut nicely so there wouldn't be any money spent. Even buying new perches is only $20-$30. What do C8.25 go for where you are? Here they are $150+ so it would be a good chunk of change to swap, especially if he needs/wants one with an LSD. Normally I'd recommend upgrading too but in this situation it makes sense to just move the perches and use what he's got. He can use the MJ one for parts if something breaks down the road. Unless you have a big lift, an 8.25 swap typically also requires a new driveshaft. D35 would be a lot cheaper and assuming the axle is in good condition should hold up just fine. The snout on an 8.25" is about 1" longer than a D35, so the D35 drive shaft ends up being too long for a stock height/stock wheelbase rig. I imagine you could probably shove the yoke in all the way and make it fit but you could be looking at a catastrophic failure further down the road, I know there's several drive shaft combo's but i wouldn't expect any of them to have enough extra slip to operate safely like that. In my experience you typically want around a 6" lift to use a D35 shaft with an 8.25 or D44. Here is a Mopar kit that includes bolts for $50..............you ain't gonna beat that. My welding may not be worth a S--- but my grinding/cutting skills are par excellence. Glad it's working for you, it is definitely something that should considered when swapping in a different axle. There are several configurations with many different drive shaft lengths, so results may vary. Not mine, been posted here a few times. Anyone know where it originated? If you already have the Dana 35, and you are going to be running stockish tires then it will be fine. I would have no problem running a Dana 35 with stock tires. Plus you can easily swap discs on to it. I would get brand new perches and u-bolts for it though, and it might be a good idea to put new u-joints in the driveshaft at the same time too. BTW.. for the sake of posterity, the Dana 35 in Jeeps is 27 spline, not 21. It doesn't matter whether its a C-Clip or non C-Clip axle. The Ford version, I don't remember.. I'm fairly sure its the horrible memories of them being blocked out by my subconscious. yup, that be mine. I am the master of the MS Paint! there's another version where I think it was Don that added in the actual width measurements.